Surfers and seafarers know that the oceans surrounding New Zealand are ever changing. Driven by the wind, warm subtropical water flows and swirls around the islands. Tides ebb and flow along the coast, and where fresh and sea water are brought together – at estuaries, fiords and river plumes – unique environments are created. The currents around New Zealand are part of a large, circulating system of water that travels around the globe. Ocean currents help carry heat around the planet. They have an important effect on the climate, and on animals in, above and near the sea. The waters around northern New Zealand flow in currents from near the equator. The water travels down past Australia to the west of New Zealand, where it splits around the islands and meets up again off the east coast. East Auckland Current, where warm water from the tropics flows around the top of the North Island, sometimes bringing tropical-reef fish. West Auckland Current, which flows southward along the west coast of the North Island. Southland Current, the main current along the east coast of the South Island. Westland Current, which flows up the West Coast of the South Island. Tidal ranges in New Zealand are relatively small (1–2 metres) compared to many other places globally. Tides are mainly caused by the gravitational pull of the moon. As the moon orbits the earth, its gravity pulls the water towards it, which is high tide. Cook Strait has some of the strongest tidal currents in the world. When it is high tide on one side of the strait, it is just about low tide on the other – the difference in water level makes the water flow very quickly. Waves are formed when the wind blows over a calm sea. 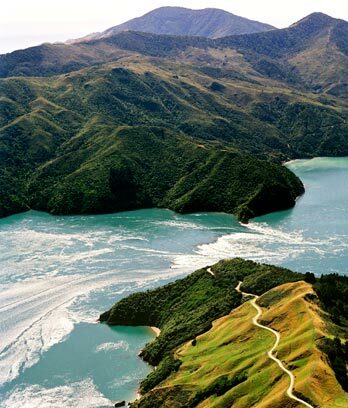 New Zealand lies in the same latitude as the roaring forties, a windy, stormy area that brings big waves to the south-west coast of the South Island. In Fiordland, rainwater runs down the steep cliffs and forms a layer of fresh water over the sea water in the fiords. Estuaries (where rivers meet the sea) are full of mud, which has been carried downstream. At low tide, they are mudflats, but when the sea comes in at high tide, they become coastal inlets. After heavy rain, mud and fresh water are carried down a river into the sea. They are pushed along by wind and tides, and spread out like a plume or fan around the coast.